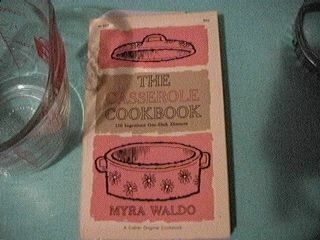 “The greatest single boon for the busy hostess is the casserole,” says author Myra Waldo. I’m afraid I’d have to disagree with that. It’s a pretty strong statement! But casseroles, like the crockpot, are certainly useful for starting your main dish early and then getting on with other things—like talking to your guests. The front cover claims 170 “ingenious” recipes; they cover: Fish and Seafood; Poultry; Meat; and Vegetable. It was published in 1963. There are a wide variety of cultures represented. If you look in the index, the first five recipes listed are Abbacchio pasticciare, Adobo, Agneau, Ahiaco de gallina, and Ajam boomboo roldjak. These are lamb casserole, Philippine chicken and pork casserole, French lamb stew, chicken soup, and Indian spiced chicken. There are some that I would consider odd, such as “lettuce casserole”. An odd variation on cooked coleslaw, with lettuce instead of cabbage. The ethnic recipes are fairly interesting. “Plaki”, or Greek Fish Casserole, for example; potatoes, olives, mackerel. Spanish Chick Pea Casserole, “Cazuela de Garbanzos”, with pork, green peppers, sausage, and tomatoes, as well as the title ingredient, garbanzo beans. There are a lot of potatoes in these recipes, and a lot of tomatoes, and quite a few with both. Even though they’re all casseroles, some are very dessert-like, as in the Sweet Potato and Cranberry Casserole, calling for orange juice, maple syrup, cranberry sauce, ginger, and butter (as well as sweet potatoes). Well, “some” is misleading; the only other dessert-like recipe is one other sweet potato casserole. Cooking times range from half an hour to two or three hours. As a bonus, they’re fairly easily converted to crockpot cooking (just half the recipes and multiply the cooking time by about 3 to 4). This is a vaguely useful book, but I find it hard to really get excited about the recipes. They’re nice casseroles, but a whole book of them? If that excites you, well, get the book. If not, it’s worth it if you see it for 30 cents at a library book sale! 2 tblsp dry bread crumbs. Wash the herring, soak 4 hours in milk, drain and cut into 1-inch pieces. Melt 1 tblsp butter in casserole. Arrange layers of potatoes, herring, and onions, starting and ending with potatoes. Sprinkle with bread crumbs and dot with remaining butter. Bake 400 degrees Fahrenheit 25 minutes. If you enjoy cookbooks, you might also be interested in A Concise Encyclopedia of Gastronomy, Bull Cook Historical Recipes, Cavalier Cooking, Classic Chinese Cuisine, Cooking the Bahamian Way, Country Commune Cooking, Life, Loves, and Meat Loaf, The Art of Korean Cooking, The Complete Book of Oriental Cooking, The Complete Bread Cookbook, The Frugal Gourmet Celebrates Christmas, The Healthy Cuisine of India, The New Larousse Gastronomique, Saucepans and the Single Girl, The Northwest Cartoon Cookery, Good Food From Mexico, Laurel’s Kitchen, The Cooking of Vienna’s Empire, James Beard’s Fireside Cook Book, French Bistro Cooking, A Fifteenth Century Cookry Boke, Crockery Cookery, Southern Cooking, The Frugal Gourmet Keeps the Feast, The Fannie Farmer Cookbook, French Cooking Simplified With a Food Processor, In Good Taste, Heritage of America Cookbook, Our Favorite Hometown Recipes Vol. II, The Indian Spice Kitchen, Japanese Country Cookbook, La Cuisine Française, Larousse Treasury of Country Cooking, The Natural Foods Cookbook, A Russian Jew Cooks in Peru, Soul Food Cook Book, The Tassajara Trilogy, Pains Spéciaux & Viennoiseries, Whole Earth Cookbook, The Wok: a chinese cook book, Southern Living Cookbook for Two, Lebanese Cuisine, The Art of Syrian Cookery, Popular Greek Recipes, In a Persian Kitchen, The Art of Pennsylvania Dutch Cooking, and The Southern Living Cookbook Library. If you enjoy Myra Waldo, you might also be interested in The Complete Book of Oriental Cooking. If you enjoy soups and stews, you might also be interested in Balti Beef Stew, Barbecue ribs stew, Chickpea stew, Corn and clam soup, Corn and spinach tofu soup, Egg Flower Ramen Soup, Heathen chili, Hot sauerkraut and sausage, Jerry’s Jambalaya, Mole chicken stew, Persian eggplant stew, Quick bean and ground beef chili, Salmon Curry Soup, Spanish chickpea stew, and Tangy corn chowder. A useful unexciting book. If you’re excited about casseroles, probably a good choice, but otherwise, look it over carefully first. The Casserole Cookbook last modified May 25th, 2009.